Robert Krueger, CEO of Lesspain software, sent me a email this week announcing the release of Kyno 1.3. One of the key new features in improved support for Adobe Premiere Pro CC. In today’s digital age, where we are overflowing with media in even the simplest projects, managing, transcoding and logging media is becoming increasingly challenging. Kyno can help. Kyno’s latest release, version 1.3, contains a wide range of improvements, most of which are based on our community’s feedback and requests. We thank you so much for your continued qualified input! It is very much a release that focusses on tweaking productivity in many workflows even more. This version adds a ton of new keyboard shortcuts, among them Send to FCP or Premiere, export to Excel, toggle drill-down, convert with the most recently used preset, switch keyboard focus between different detail view areas, set ratings, zoom in/out. For the full list, consult our release notes. 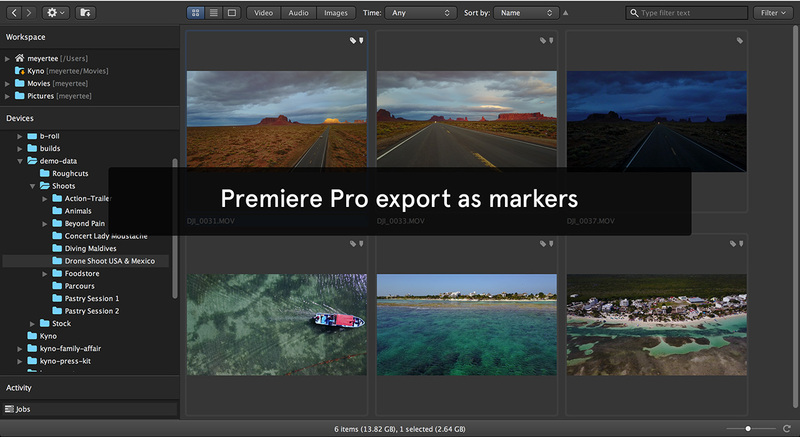 The Premiere Pro integration is much more flexible as it now allows you the option to use Kyno subclips as markers in Premiere, in addition to the option of using them as Premiere subclips. Selecting the most recently used conversion presets is now much faster. Kyno’s naming engine has lots of new metadata variables for experts to use, as well as an improved UI. The expert function to pre-analyze content to speed up certain workflows has become more powerful. Batch tagging has become more efficient and the Excel export more flexible (you can now select to only export subclips, so building shot lists can be done in parallel to marking frames for still export). New filters have been added so you can now filter your material based on scene, shot, take and more descriptive metadata fields. The subclip export has been improved further, so the exported subclips inherit all the descriptive metadata they had within their original clip, which makes popular team workflows, that are based on pre-edit material preselection, even more efficient. Apart from this there have been numerous little usability and productivity improvements as well as a number of improvements in the areas of speed and stability and some bug fixes. For details, please consult the full release notes. The Windows version is coming along nicely and we’re happy to announce a beta registration program that you can find at kyno.software/kyno-for-windows-beta. A free trial is available. For more information, visit Kyno.software. UPDATE: By the way, Robert tells me they are running a 25% off summer sale to celebrate the new 1.3 version of Kyno. Check their website for more details. Edit smarter with Larry’s brand-new webinars, all available in our store. Access over 1,900 on-demand video editing courses. Become a member of our Video Training Library today! Sign up for Larry’s FREE Weekly Newsletters. There's no finer resource on the web. Not a member? See The Different Membership Tiers. Become a member of our Video Training Library & Get unlimited access to our highly-acclaimed training, Thousands of movies available 24-hours a day, 7-days a week. LarryJordan.com is owned by Thalo LLC and is a part of the Thalo® family of websites. 2018 © Thalo LLC. ALL Rights Reserved.